Design and construction projects are long and complex and require collaboration between many parties. While there are benchmarks in place to help owners achieve efficiencies, the traditional delivery model leaves much to be desired. What if we could do better? What if we could create buildings that exceeded expectations instead of falling short? What if we could create buildings that are beautiful, efficient, useful, cost-effective and sustainable instead of often needing to compromise? What if a building operated as a whole instead of multiple, disparate systems housed inside one facility? Enter integrating project delivery, or IPD. Why they are all necessary. How they can be put into practice and key examples. 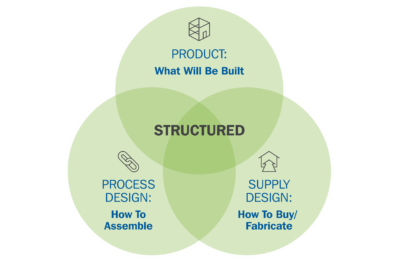 How do traditional building methods differ from an integrated approach? According to The American Institute of Architects (AIA), they differ in more ways than one. Where to start? A simple framework. This guide will briefly cover each of the key elements and how they work together toward the common goal — a product where the sum is greater than its individual parts. 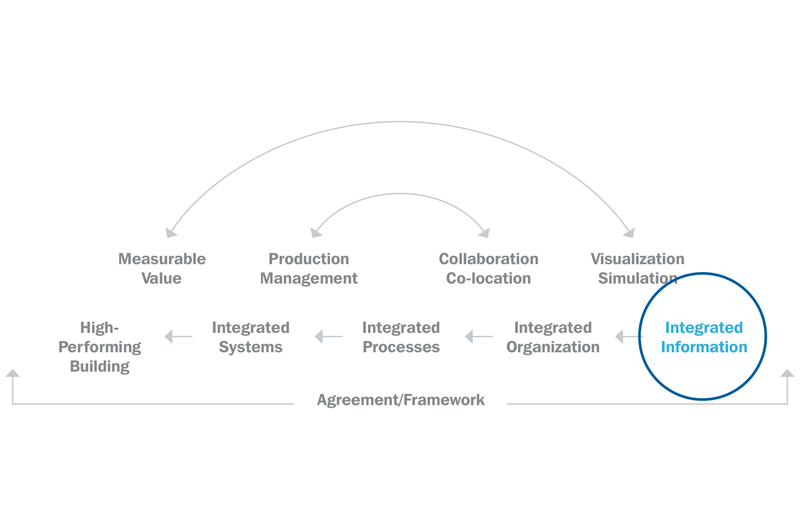 Learn more about how to put the simple framework and integration into practice in the book, Integrating Project Delivery. Between The American Institute of Architects (AIA) and other industry organizations, there is a large amount of good information on IPD available. 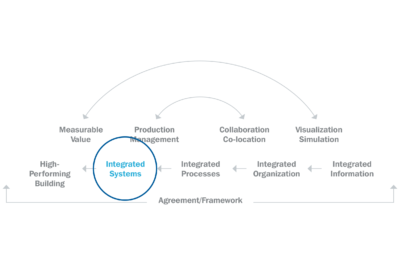 But since it involves a shift in mindset and practice in just about every aspect of designing, building and delivering facilities, the authors dug deeper and created a roadmap for integration. 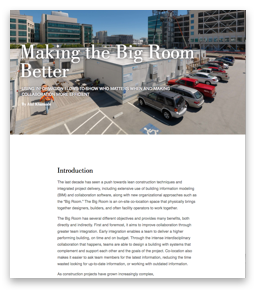 It took eight years to write Integrating Project Delivery, because the authors wanted to explain what IPD is and develop a roadmap, or framework, that can be applied to deliver high-performance buildings. The book was written to empower owners and AEC teams in a wide range of markets to learn from the experience of other pioneers who have been leading the industry in this relatively new delivery model. It all starts with a high-performance building (the desired outcome) and works backwards to determine all the components necessary to get there. While this simple framework is not designed to be followed in a linear fashion, it is a useful demonstration of how the elements must work together. 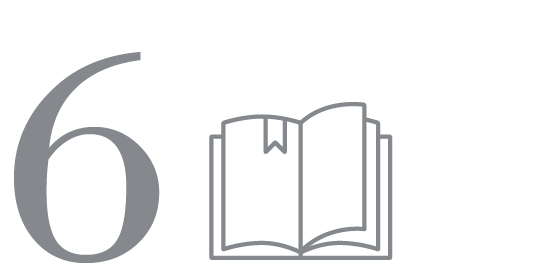 Read Chapter 6 in the book, Integrating Project Delivery. Design and construction projects require collaboration between many parties. While there are benchmarks in place to help owners achieve efficiencies, the traditional delivery model leaves much to be desired. Because high-performance buildings have such aggressive goals, they require performance that is difficult to achieve with current disparate methods, processes and systems. 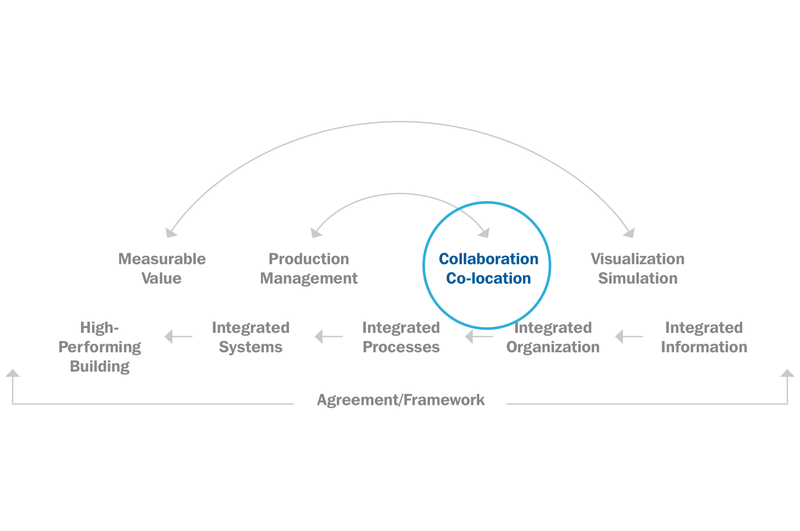 For true integration, behaviors must shift to become more collaborative while engaging in every aspect of the simple framework. 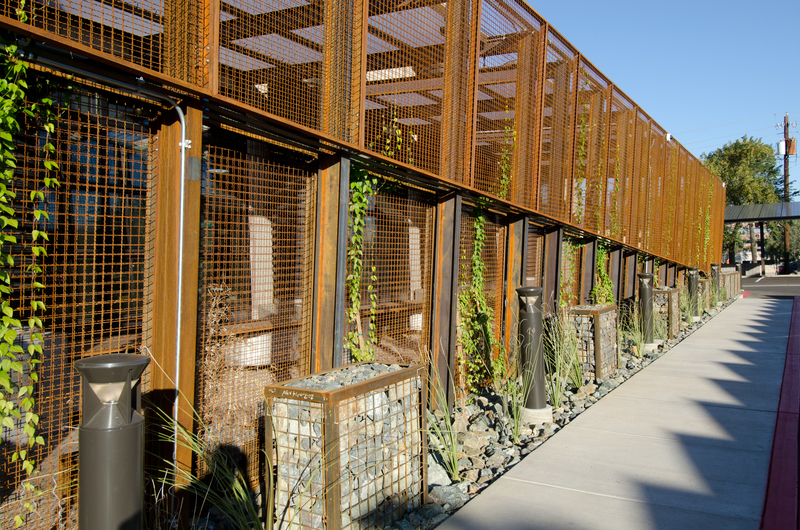 DPR’s Phoenix office demonstrates how an integrated systems approach leads to a high-performing building. While the industry standard is to build oversized cooling systems to accommodate worst-case scenarios — increasing installation costs, wasting energy and costing more in overall operating costs — the team instead embraced the concept of “right-sized” cooling for everyday conditions. By understanding how the cooling system affected all other systems, the team achieved the right size and the best energy savings. In addition, for the office renovation, the team modeled its performance and used computational fluid dynamics (CFD) simulations to predict the temperature and distribution inside the building. The integrated systems approach enabled DPR to transform a marginal 1972 retail building into a certified net-zero energy showcase facility, with a projected payback of just 10 years. Achieving optimal performance is feasible when all of a building’s systems are designed to work together and complement each other. While traditional buildings are designed as a series of disparate systems combined into a building with each fabricator focused on a specific discipline, IPD requires that all designers, engineers, builders and specialty trades collaborate to give input on the final design at the front end of the project. The result? The best possible outcome. There’s so much more to IPD than integrating the systems of the building itself. How can integrated building systems be achieved? It all begins with understanding user values, such as environmental impacts, energy consumption, ease of maintenance, flexibility of layout and other values. 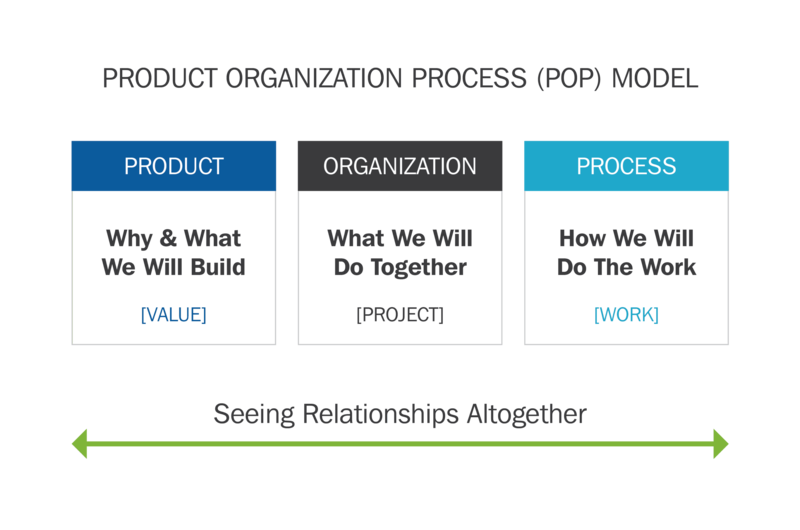 Team members can use a product organization process (POP) framework to interview stakeholders on a variety of building use and comfort criteria. From there, team members must map these user values to building features, then build integrated simulation models to predict how these systems will interact with each other. Once the design is finalized, the team develops a fully integrated building system that achieves optimal performance on the metrics that matter most to the owner. Read Chapter 7 in the book, Integrating Project Delivery. 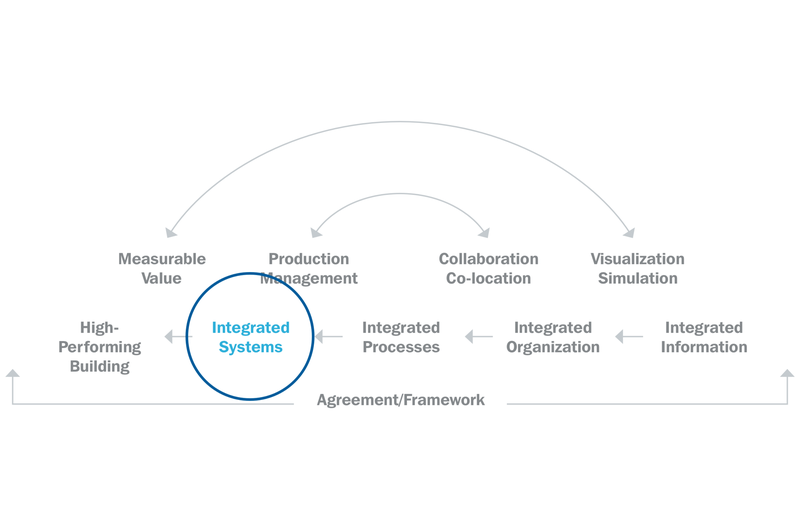 While the process for traditional product delivery is often linear, where one discipline performs in a silo, then passes that portion on to the next discipline, integration requires the exact opposite. 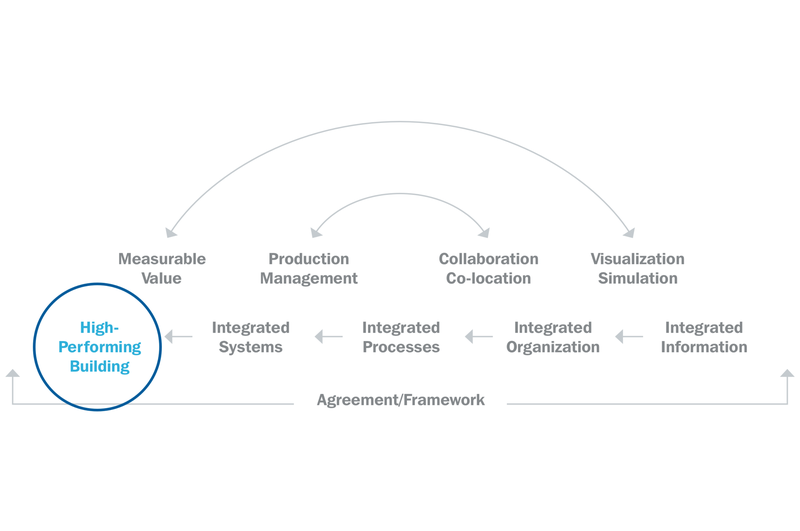 Upstream and downstream collaboration is essential, including user and stakeholder values, construction methods, building operations and sustainability. It’s the only way to continuously validate design against user values and make necessary adjustments. How can integration be achieved? Off-site fabrication enables key components to be produced together in a safe and controlled environment, reducing costs while enhancing safety and construction efficiency. But it can only be achieved when the design is as close to the final product early on. This requires input from disciplines who may not weigh in on initial designs, like building occupants and operators, to ensure all performance goals stay on track. 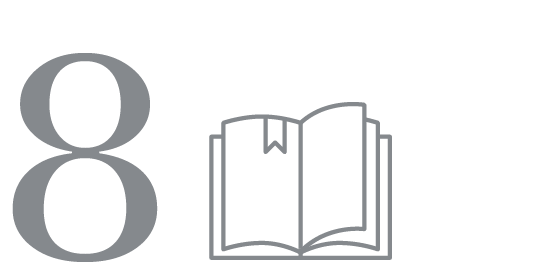 Read Chapter 8 in the book, Integrating Project Delivery. 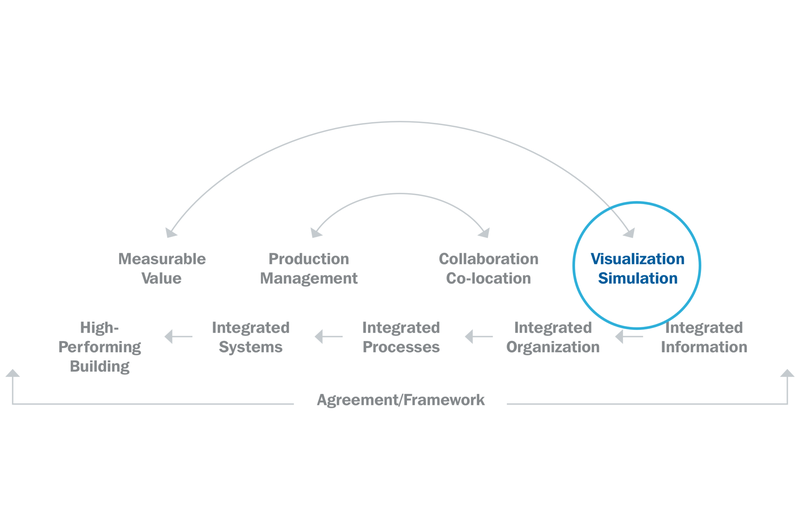 In traditional design and construction projects, players from many different firms collaborate and share necessary information, but they are primarily motivated to only minimize risk and maximize profit for their own bottom line. True integration requires a shift in mindset and behavior. Acting as a team of strategically assembled experts from various firms isn’t enough. They need to act as if they belong to the same organization — one that is focused on the good of the project above all else. 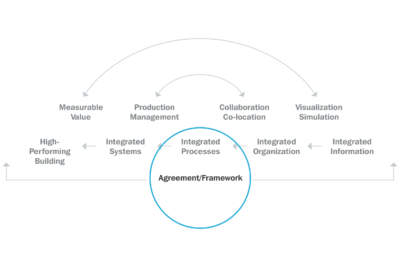 The structure of an integrated organization is established by the contract or agreement. There is no formal chain of command, so everyone is responsible for the project as a whole — not just their individual work. 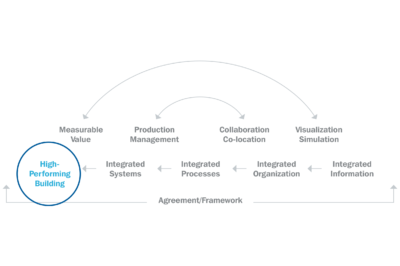 How does the organization align people to the project? How is a truly integrated organization achieved? Work must be connected through project organization to customer value. 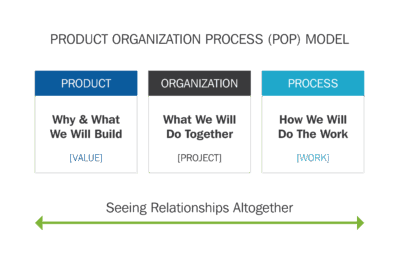 A product organization process (POP) model can be used to connect work to what is being built. 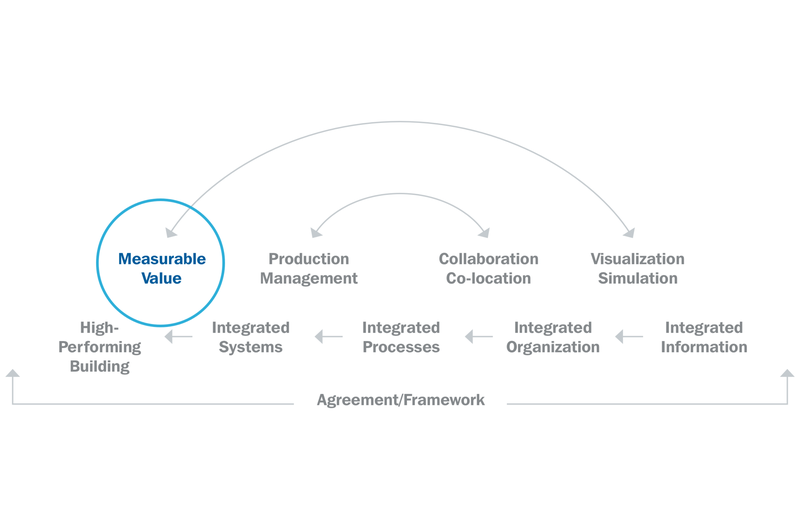 Mapping the flow of value through value streams enables individuals to better align themselves with their work processes. By forming and working in cluster teams, work is structured to produce greater value. Implementing integrated concurrent engineering (ICE) is a valuable tool, helping teams work faster to make decisions and solve problems. Not surprisingly, research has shown that the strength of a team is tied to the overall cost, schedule and quality outcomes of a project. Design and construction teams that were highly cohesive reported lower cost growth and a better building turnover experience for the owner. How can you manage and strengthen your team to ensure your project is set up for success? To design and build the Sutter Health Eden Medical Center (SHEMC) replacement hospital, 11 companies formed an IPD partnership. The partner companies’ leaders committed from the outset to doing things differently by signing an Integrated Form of Agreement, a clear statement of expectations for the project delivery team, including on-time delivery and a total cost of $309 million. The stakes were high for all partners — under the contract, they would win or lose together based on overall team performance. Working together, the integrated team developed a concept, estimated costs and planned for construction within budget and schedule constraints. Creating core teams and clusters, partner company leaders participated in weekly design coordination, cost review and planning meetings, reporting status and expressing any potential threats to the budget or schedule. The integrated project was delivered within budget, one week ahead of the deadline for California regulatory agency signoff and six weeks ahead of the first patient deadline. The team achieved all the owner’s goals. 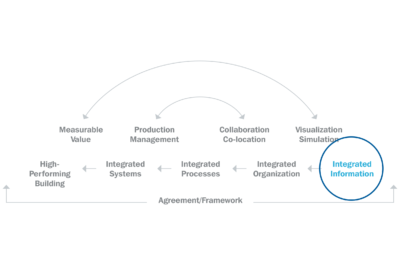 In IPD agreements, the management structure is typically defined in the contract, and project teams are led by managers committed to making "best-for-project" decisions. Develop a clear and common understanding of project values and goals. This is the foundation of an IPD project — clearly defined project values and goals that are determined by all key stakeholders. Clearly communicate these values and goals to ALL participants. In addition to clearly communicating values with all participants, leaders must appropriately onboard any subs or consultants, as well as continually reinforce the goals and values to the whole team through repetition and recognition. 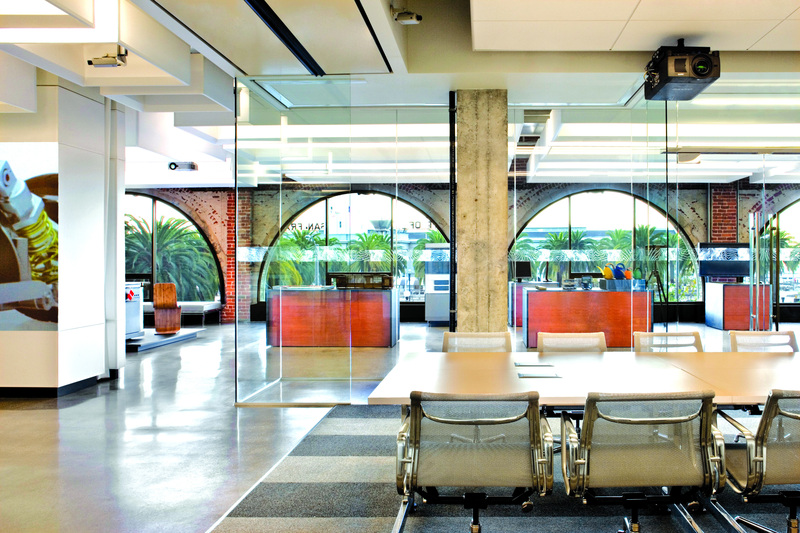 Create a functional physical and virtual space for co-location. To enhance performance, digital networks, collaboration systems and other elements must be established up front. Define the necessary project teams/select team members.Teams should be diverse, cross-functional and have different viewpoints and perspectives. Not only does this diversity provide more information to inform the design, the tension between perspectives stimulates greater creativity. 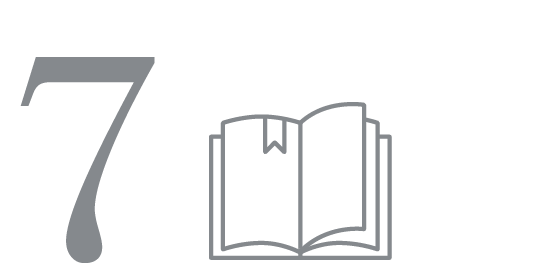 Provide training and mentoring for project teams.Training and mentoring should address three task performance issues: level and coordination of member effort; appropriateness of the task and performance strategies the team is using; and degree to which the team leverages all of its members’ knowledge and skills. Monitor and adjust team dynamics as needed.The team’s strengths and weaknesses, including conflicting personalities, should be reviewed and addressed to minimize negative impacts. Team dynamics can make or break a project. Managing groups of diverse people from a wide range of disciplines and companies requires deep commitment and understanding of how to create, support and nurture them to deliver a successful project through a high-performing team. 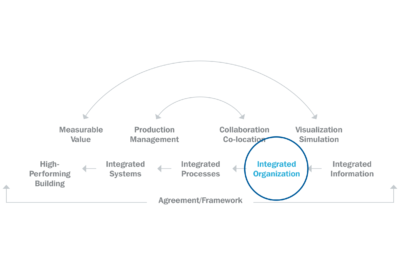 What does a truly integrated project organization look like? 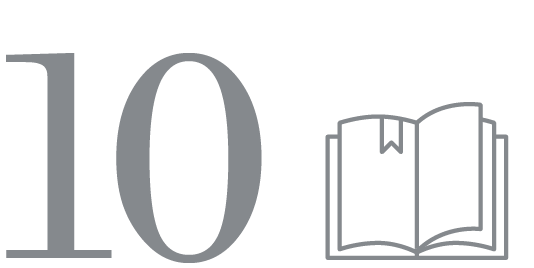 Read Chapter 10 in the book, Integrating Project Delivery. It only seems logical that all project information should be integrated and readily available by all team members. While the traditional approach often stores information in different formats and different systems, integration requires real-time access to the latest information regarding project scope, cost, schedule and quality. Without it, team leaders are flying blind. How can integrated information be achieved? 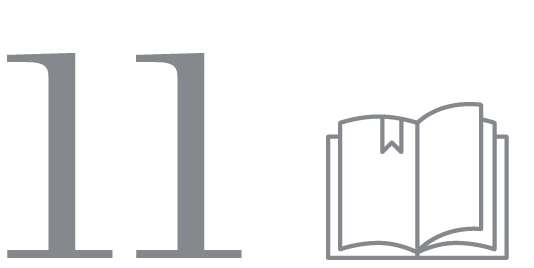 Read Chapter 11 in the book, Integrating Project Delivery. The only way to deliver a high-performance building is to understand and define the values that will drive it. As such, this is the most important step in the integration process. While some owner objectives are immeasurable, there must be some agreed-upon objectives in place to measure and track performance. A highly valuable building design considers both cost and income of a facility when making decisions that affect design, construction, operation and use. Change orders in the field can add up to lost time and expensive rework. When planning the design and construction of this state-of-the-art, 250,000-sq.-ft. medical office building, DPR, its design partners and the owner enlisted the help of MEP and fire-protection subcontractors experienced in BIM. 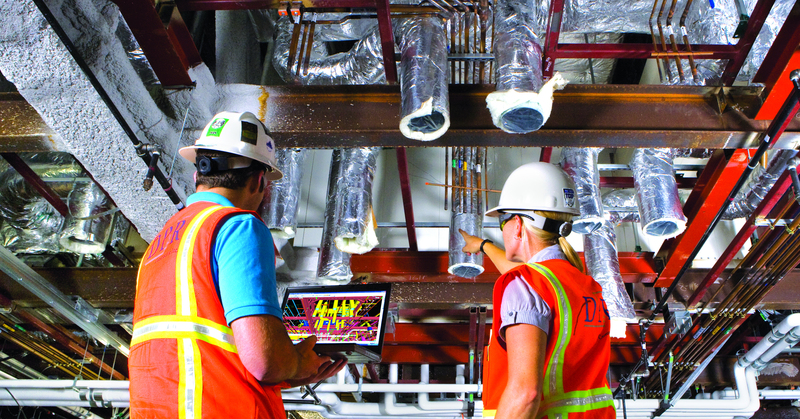 With ambitious goals of limiting reciprocally interdependent work during construction and avoiding rework, the team used BIM and 4D simulation to sequence the MEP work, then broke the site into quadrants and identified the installation sequence for each. Most of the materials were prefabricated and delivered just in time to further enhance efficiencies. The team’s efforts paid off — only two of 233 requests for information were related to field conflict, and zero change orders were issued due to field conflicts. The trades finished their work ahead of schedule and enhanced this part of the project by approximately 20 percent. 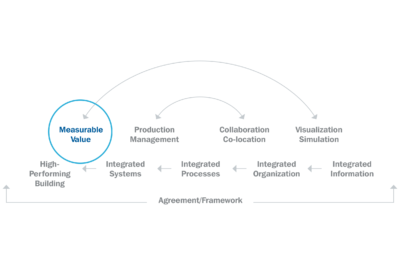 How can metrics drive outcomes? 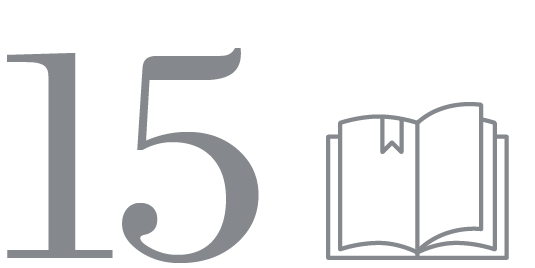 Read Chapter 15 in the book, Integrating Project Delivery. Project teams are always producing a mountain of information, whether it’s about design, procurement, quality, schedule, turnover, etc. All of this information is necessary for the safe production of a high-quality, high-performing building. The question is whether the right people are doing the right thing at the right time. If not, time and money are being wasted. 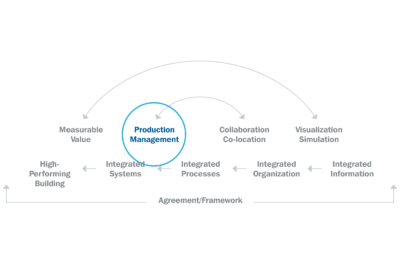 Producing precisely what the downstream customer needs when they need it is the goal of Lean production management. While this sounds straightforward, it can only be achieved when people work together as an integrated, aligned team. Plan work as a team, not for the team. Ask the doers to become planners/doers. Develop a clear and common understanding. Every individual on a team is both a customer and a supplier. Everyone is responsible for clearly describing what they need and understanding what they will be providing. Both parties must agree on what will be delivered and when. It can’t be dictated. Create a big picture strategy. Develop an end-to-end plan showing when big decisions and chunks of work need to be completed. Next, develop the plan. All those involved in each big chunk of work should analyze the requirements and develop a clear plan for how they will make the work flow—pull-planning backwards from key milestones and gathering the information, materials and resources needed to complete work. This enables the people responsible to look ahead to identify and remove roadblocks. What are you planning to do by tomorrow? Managers on an integrated team become a lot like coaches. They help teams and work crews improve by tracking performance against team-set targets and looking for ways to improve the work. Managers also watch “game film of first installations” with work crews to see opportunities to make work easier, safer and better quality. 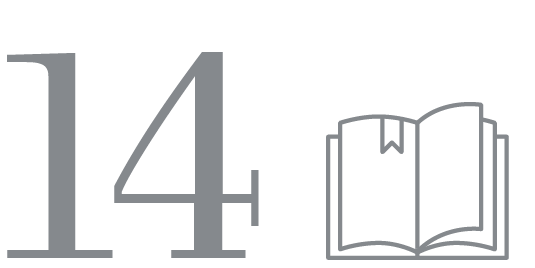 Read Chapter 14 in the book, Integrating Project Delivery. Co-location is the execution of work by key team members in a single physical location, often referred to as the “Big Room.” While the cost of relocating team members from across the country (or even globe) to a single space, providing travel and hotel accommodations and more, can be significant, the result is a better building at a lower cost. 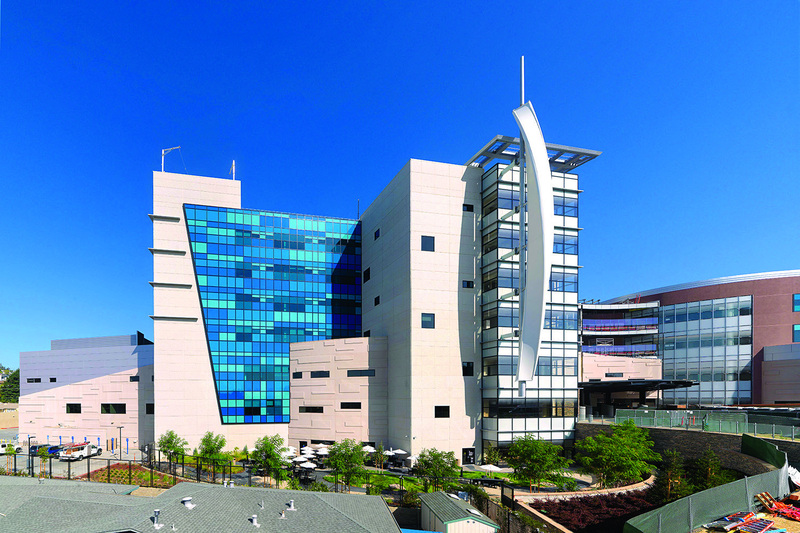 More than 19 different companies partnered to design and build an 878,000-sq.-ft. facility comprised of three hospitals. 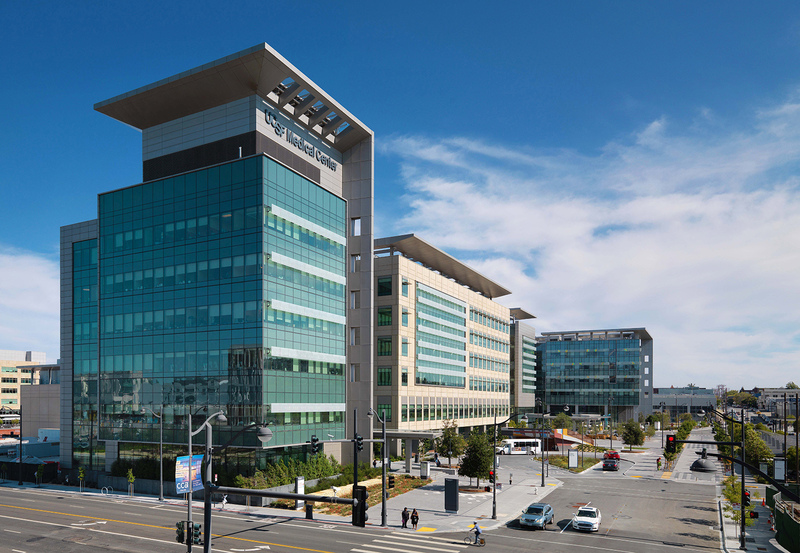 Because this facility was a public-sector project, UCSF Medical Center was unable to adopt a multi-party agreement. However, the owner and all parties involved committed to the same level of integration that would be required of a team in a multi-party contract. The team determined collaborating in the same space early on was vital to project success. So the owner and 250 builders, designers, consultants and subcontractors co-located to a 14-acre Integrated Center for Design and Construction (ICDC) during the design phase. There, they established ground rules for working together and metrics for accountability. Co-location resulted in more efficient decision-making while keeping everyone focused on the project goals. As a result, the complex hospital facility was completed eight days ahead of schedule, even though the project required $55 million in scope changes, none of which impacted the budget or schedule for an on-time opening. A major benefit of having the team in a single location is the ability to add integrated concurrent engineering, or ICE, sessions. Rather than the consecutive design activities of traditional methods, big design decisions are made simultaneously — significantly accelerating the evaluation of design alternatives and decisions. 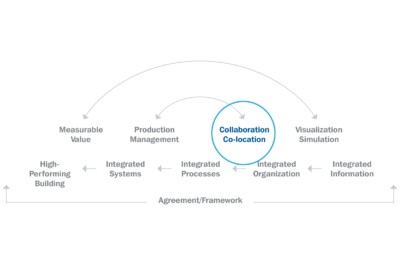 For a deeper dive into co-locating best practices, read “Making the Big Room Better” by Integrating Project Delivery co-author, Atul Khanzode. 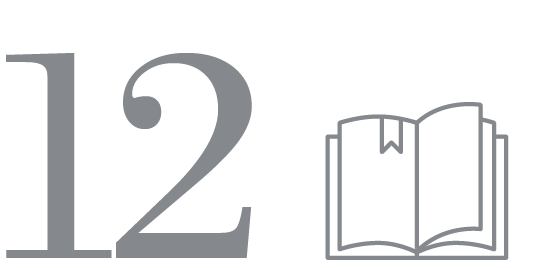 Read Chapter 12 in the book, Integrating Project Delivery. Autodesk tasked DPR and its design partners with designing and building Autodesk’s new 45,000-sq.-ft. corporate office using integrated project delivery (IPD). 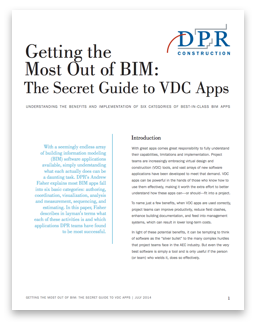 Leveraging the latest Autodesk simulation software, the team used BIM to inform design decisions, avoid costly reworks and increase efficiencies. From project estimating to 3D clash detection and 4D simulations for MEP sequencing, simulation played a key role in successful completion of the project. The highly complex project was completed in only 22 weeks and achieved LEED-CI Platinum certification. Sustainability goals were also achieved, including recycling 95 percent of all construction waste. 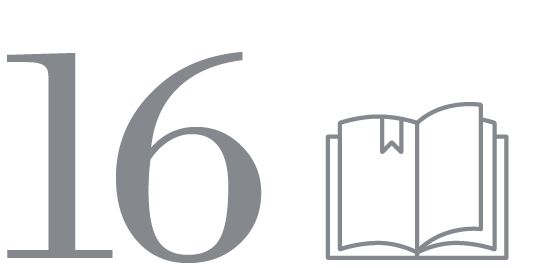 Read Chapter 16 in the book, Integrating Project Delivery. Contracts may not be fun to discuss, but they are key to setting up your integrated project up for success. From how risks and rewards will be handled to decision-making processes and even establishing a separate legal entity for the project, the IPD agreement is layered, complex and necessary to deliver a high-performance building. An IPD contract is designed to provide the structures that allow for the other IPD elements in the simple framework to function effectively. Will the agreement be a multiparty or polyparty contract? Will subcontractors and consultants be added via sub-agreement or joining agreement? Will standard IPD contract forms such as ConsensusDOCS or AIA C195 Series be used, or will you use a custom agreement like the Sutter Health Integrated Form of Agreement (IFOA)? Which business model will be used to manage the project and its incentive structure? 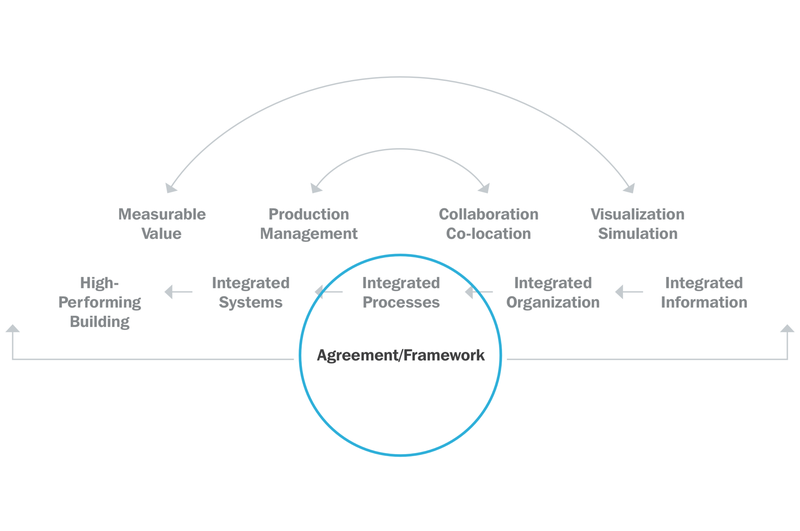 An IPD agreement is a different approach designed to promote owner/project delivery team accountability, shared governance and risk/reward, information sharing, and collaboration. Be sure to consult with an attorney who specializes in such agreements when negotiating a contract or holding a contracting workshop. Executing a highly integrated project is a significant undertaking requiring buy-in from all key stakeholders, continuous collaboration and hands-on owner involvement. However, the result is well worth the effort—a high-performing building designed and built with the owner, occupants and environment in mind. The simple framework, developed by Martin Fischer, Howard Ashcraft, Dean Reed and Atul Khanzode, is more than a theory. It’s a model that has been put into practice for the last several years by industry leaders to deliver the best possible outcomes. Now it’s your turn. And it all starts here. 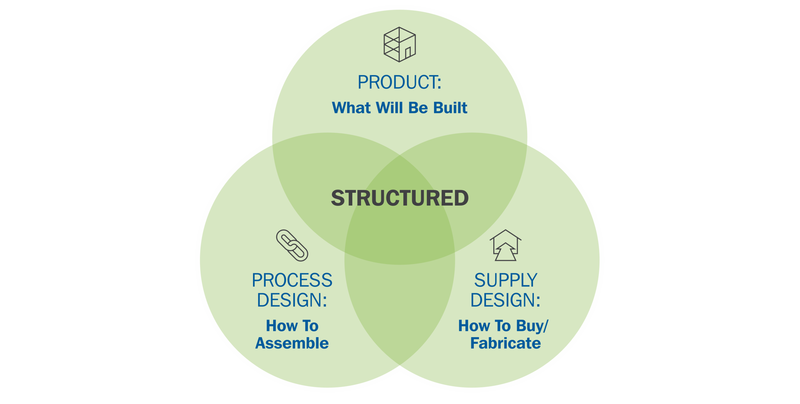 There are several ways to apply the simple framework to your next project. 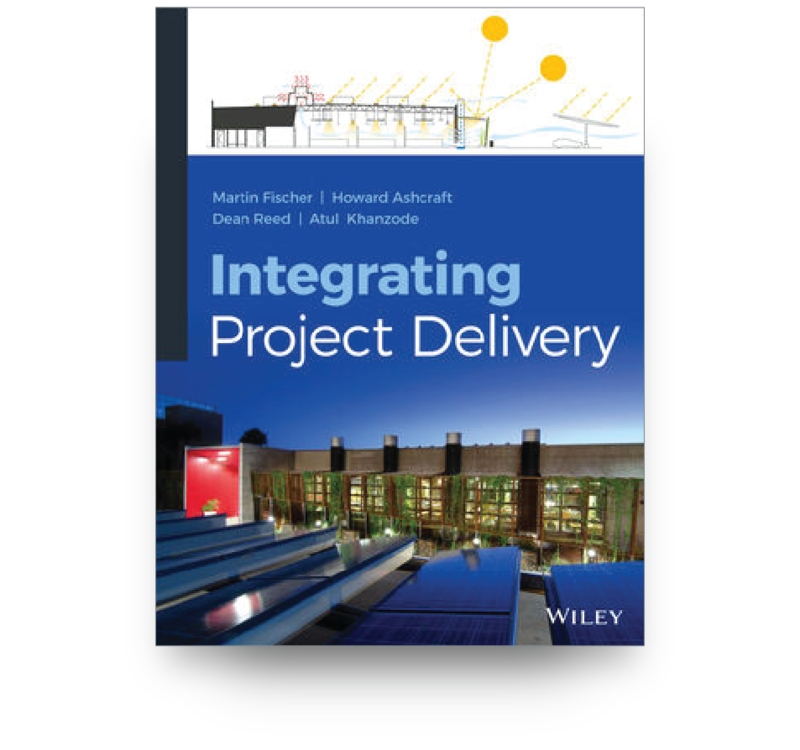 For a comprehensive playbook of the steps needed to succeed, purchase the book Integrating Project Delivery, published by Wiley and written by Martin Fischer, Howard Ashcraft, Dean Reed and Atul Khanzode. Martin Fischer is a professor of civil and environmental engineering at Stanford University and serves as the director of the Center for Integrated Facility Engineering (CIFE). Howard Ashcraft is a Fellow of the American College of Construction Lawyers and the Canadian College of Construction Lawyers (hon. ), a member of the AIA California Council (hon. ), and an adjunct professor of civil and environmental engineering at Stanford University. Dean Reed is an advocate, organizer and educator for lean and integrated project delivery at DPR Construction. Atul Khanzode leads Technology & Innovation for DPR Construction, where he assists project teams in implementing lean construction and virtual design and construction (VDC) methods.